FRANKFURT -- Daimler CEO Dieter Zetsche said the automaker plans to lower sales incentives on Mercedes-Benz vehicles and raise prices on some models as demand outstrips supply. Zetsche told analysts on Feb. 7 that he expects "pricing to improve significantly" this year, and that in every market he visits he receives pleas from dealers to provide more of the automaker's compact cars such as the new CLA. Fourth-quarter deliveries for Mercedes's compact vehicles climbed 44 percent, while demand for the revamped flagship S class surged 43 percent. Daimler forecast on Thursday that 2014 operating profit from ongoing operations will greatly exceed the 7.9 billion euros ($10.7 billion) achieved last year on demand for the new GLA compact SUV and redesigned C-class sedan. Zetsche has vowed to regain the top spot in luxury-car sales by the end of the decade after losing it to BMW in 2005 and ceding second place to Audi in 2011. Mercedes plans to introduce 30 models through 2020, with a sports car among the dozen vehicles that have no predecessor, Zetsche said on Thursday. Daimler's stock has gained 44 percent in the last year, valuing the manufacturer at 68.1 billion euros. Mercedes-Benz next month will roll out a new version of the mid-sized C-class sedan, its best-selling model, and the GLA, an all-new compact SUV. The manufacturer is also starting to offer an electric version of the B-class compact in the U.S., and will debut a coupe variant of the S class. The brand's deliveries rose 15 percent in January. Zetsche is also working to turn around the unprofitable Smart brand by teaming up with Renault to develop new models. Smart this year will present a new version of its iconic two-seat minicar and revive a four-seat model that will share its underpinnings with the French automaker's Twingo hatchback. "Costs are going down while content and performance are significantly improving," Zetsche said of Smart, adding that he expects the marque to be profitable in the future. The Mercedes-Benz Cars division, which includes Smart, has a goal of cutting costs by 2 billion euros in the two years through 2014. 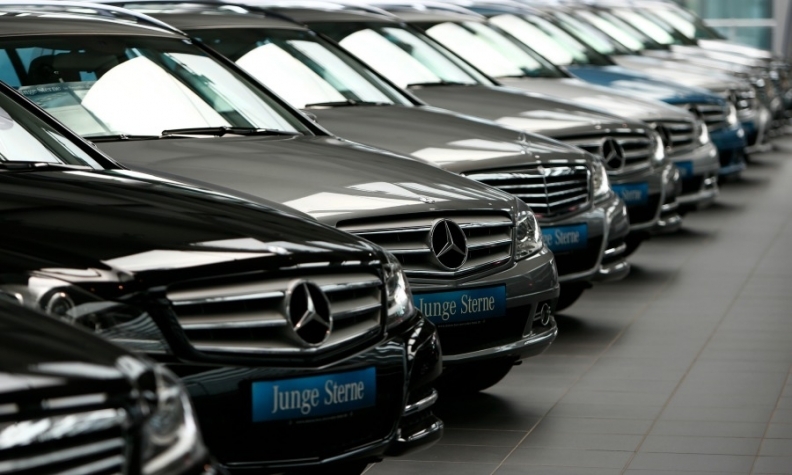 The unit saved 800 million euros last year, beating targets, Daimler said on Thursday. The division's fourth-quarter operating margin widened to 7.5 percent from 5.3 percent a year earlier.